Preemie twins are born before 37 weeks gestation. 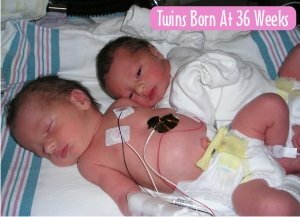 On average, twins are born between 35 and 38 weeks. Some reports suggest that approximately 50% of twins are born prematurely. If you are pregnant with twins it's a good idea to prepare yourself for the possibility of their premature birth and a possible stay in the NICU (Neonatal Intensive Care Unit). 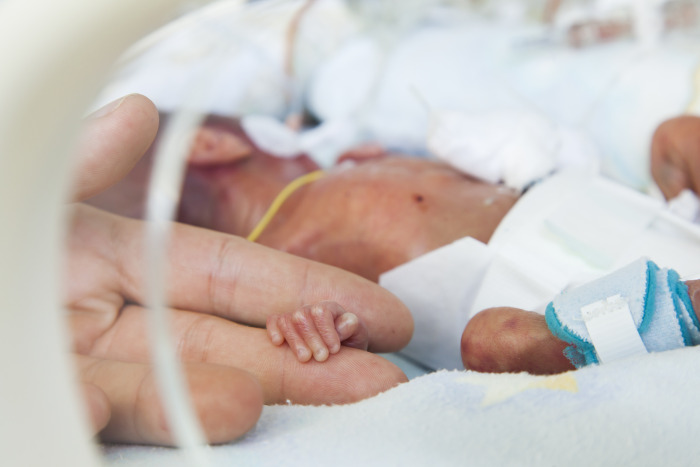 Even if you have a healthy pregnancy and birth, your babies may still need some time in the NICU. There are many reasons from very minor to extremely complicated. In any case, good information can only help! There are some factors that may affect your risk for premature birth, such as a previous pregnancy that ended prematurely. Extremes of weight and/or if it's a first pregnancy may also increase risk. Your particular risks should be discussed thoroughly with your doctor or midwife, as well as the symptoms and signs of preterm labor. Every mother carrying twins should be evaluated by a qualified professional throughout pregnancy to ensure the best possible outcome. Before you read any further I want you to remember a stay in the NICU will not happen for everyone. And, even if it does, the advances in medicine put the odds more strongly in your favor for a positive outcome. This article is about staying informed and being prepared for any outcome. Nonetheless, this is still a difficult subject to write about. With all of the varying attitudes from, "It's never going to happen to me" to "I'm scared to death", it can be hard to find the middle ground between being prepared for the worst and staying positive. After all, we do want to enjoy this special pregnancy as much as possible! There are other articles out there that consider any talk of preterm labor or premature twin birth to be depressing, scary, and useless. Some even suggest that positive attitude alone will get you through with flying colors, even thought a staggering 50% of twins are born prematurely. That's why I believe it's a smart idea to familiarize yourself with even the remote possibility of a NICU stay well before your twins are born. I also believe you can remain very positive and even excited about your impending birth if you simply look at the information in a logical and compassionate way. One of the best ways to do this is through other parents that have been there. There are tons of personal blogs, web sites, and books (listed below) that give detailed information and support on the issue of preemie twins. Trust me, it's worth looking at even a minimal amount of information. Again, premature birth and/or a stay in the NICU will not happen for everyone...this information is here to help you feel empowered, not more worried! Talk to your doctor about the hospital's protocol for premature birth and find out what level of care they can provide for preemie babies. There are several different levels of neonatal care which will vary by hospital. Most hospitals will let you have a look at their facility if you ask. You should also start talking to the pediatrician who will be caring for your babies. They will be able to give you some of the best information on premature twins and what particular issues they may be faced with. Whether your twins will need special care for a few days or a few months, it's never easy. But, being a bit prepared mentally to leave the hospital without your babies will surely alleviate some of the anxiety or stress that you may experience. You have to keep in mind that your babies are in the best possible care and that it's okay to care for yourself, as well. While your twins are in the NICU try to spend as much time holding them, talking to them, and nursing/feeding them as possible. For some extremely preemie twins, this may not be feasible (at least not right away). If you plan on breastfeeding, you can pump your milk at home (or, in some cases, the hospital) and bring it to the NICU daily. Your breast milk is one of the best gifts you can give premature babies! Perhaps you will want to dress your preemie twins in clothing from home. This may be a comfort especially if your twins will have a long stay in the NICU. 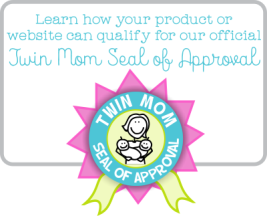 There are wonderful web sites that offer NICU approved clothing. Remember, even though the bonding process may seem slow or even awkward, you are still, without a doubt, bonding. When my own twins were born at 36 weeks, they stayed in the NICU for 6 days. I thought for sure that having them at 36 weeks would be no problem. Although they were over 5 lbs each and pretty healthy, they still had to deal with jaundice, proper weight gain, and some minor breathing issues. Naturally, I was distraught and completely unprepared. I felt horrible about leaving them at the hospital so I could go home for a shower and change of clothes. I was totally hormonal, tired, worried, and sore too! I never thought seriously about having them in the NICU and I wished I had a better mind set. In hindsight, I can see that if I had taken a more active look at the information that was available to me I would have coped a whole lot better. I imagine I would have felt a little more relaxed than worried at the time. Just like a quarterback preparing for the big game, much of it is mental. Of course, this is only my personal experience, but I urge all those newly pregnant with twins to explore information on premature birth. One of my best friends (and fellow twin mother) also had this experience, but on a much grander scale. She gave birth to her twins in a foreign country and at only 32 weeks gestation. You can read her personal twin story, In Disguise, on the Twin Stories page. On a lighter note, it should be mentioned that there is an increasing percentage of normal, healthy, twin births. In fact, my own twins as well as those of my best friend are happy, healthy children who continue to grow and thrive. Just be sure to listen to your body, stay informed, and always seek the advice of a qualified professional. Cheeky Chums - The Premature Baby Store for the UK!